May 18, 2017, a day that stopped the Santa Fe & Western Railroad. April and May were very wet months. Basements and crawl spaces took on water for the first time in several years. One of our neighbors contacted the DuPage County Building Department and stated that they believe our garden railroad (installed in 2005) caused their crawl space to flood. An inspector visited our house, and spoke to my current wife Lorrie, asking her if we had obtained a permit for the work in our yard. Well, we had not, so we were "Red Tagged" which prevented me from doing anything in our gardens, related to remodeling until a permit was obtained, work completed and final inspection made. Utilizing a civil engineer, an Illinios architect and a storm water management engineer, we finally obtained our permit on August 18, 2017. I had included some "proposed work" on the plans, so I had to finish that before obtaining a final inspection. The inspector was very cooperative with us, understanding that no work would take place in the winter. DuPage County permits must have inspections at least every 90 days so I had to meet the inspector a couple times during the winter. I timed the inspections when there was snow on the ground, so he would note that on his inspection sheet, and extend me 90 more days because he could not see the work in the garden. We received our final inspection on June 15, 2018. As mentioned before, we added an "additonal" garden area next to our deck, that we want to build a "Grand Canyon" themed area. This area will have a small loop of track, but more importantly, have five custom built scale models of buildings from South Rim of the park. In order to build accurate models, an older friend of mine (Ron) and I traveled to Arizona in October, in order to photo document and measure these five structures. 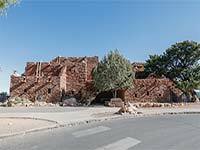 We spent 3 days photographing and measuring the Santa Fe train station, the El Tovar Hotel, the Hopi House, the original mule barn, and the Lookout Tower. During the 3 days I was walking around with a measuring tape, measuring wheel, and clipboard with graph paper, not one park employee approached us, asking what we were doing. We did have several park visitors ask, and I just said that I am taking measurements, so that I can build this building in Illinois! Some said, "oh, OK", but other stood and and just scratched their head. I let them think about it a few seconds, and then would tell them specificly what we were doing. This is the Santa Fe station. It was built in 1910. I read that it is the oldest, log construction train station still operating in the US. You can see a couple of "rodents" walking through the shot. They had no photo etiquette at all! They even stopped at one point and we just got tired of waiting, took the shot and moved on. 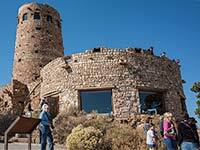 The Hopi House, which sits right on the rim of the canyon, was opened to the public in 1905. It was designed by Mary Colter and used to house local indians and provide a place for them to market their wears. The El Tovar Hotel was built in 1905 and is only a few feet from the edge of the south rim. 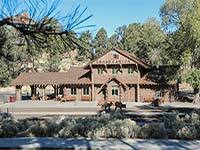 It was built for the Santa Fe Railroad, and operated by Fred Harvey for many years. It is still in operation and has a one year waiting list to get a room. 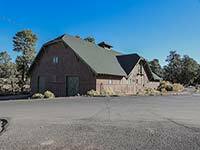 The mule barn, built in 1905, was originally used for housing the mules that would carry visitors down into the canyon. At that time it was nicknamed the "Fred Harvey Motor Pool". The duty of housing the mules has since been moved to a newer barn, just west of this location. This building is now used as maintenance storage but will reflect its original use in our garden. The Lookout Tower is located at the far East end of the park. This was also designed by Mary Colter. This structure is actually steel framed, but its appearance would not suggest that. this will be one of the most challenging structures for me to build, due to its circular shape.